PPC managers have different targets for their clients. One of the most common targets is to manage the campaigns based on an average maximum cost per conversion (CPA). What many clients –and PPC managers- don’t know or don’t realize is what the true cost of the extra conversions is. Even if the average CPA is below the maximum allowed CPA, the last conversions might be too expensive and maybe even leading to a loss for the client. Lets have a look at an example. Assume you are managing the account of an e-commerce store that sells calculators. They sell for $25. The profit on a sale is $15, with just the ad spend to subtract from the profit. You are currently managing the campaign and you get 100 conversions for a total cost of $1,000. This leads to a CPA of $10. The profit for the client is $500. The client however told you the CPA could be $11 if he gets more conversions as the $11 is still well within his profit margin of $15. As a good PPC manager you started pushing the best keywords and magically knew to push 20% extra conversions until you reached an average CPA of $11. 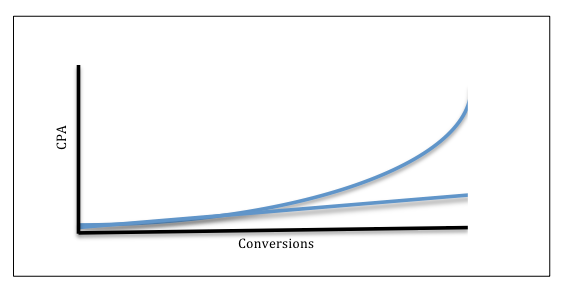 So you now have 120 conversions for a total cost of $1,320. You are happy, the client is happy and you live long and happily ever after. But should the client be that happy? This leads to a CPA of $16 of the additional conversion! He actually lost money on the additional conversions. The profit is now $480. So are those additional conversions bad? Not per definition as it depends on the goal of the client and other factors that we sometimes don’t know as PPC manager (profit margins, life time value of a client, branding value, increase of the market share etc). It’s important that both you and the client are aware of the price of the additional conversions. Rick Vugts is the co-founder of Visible Online Marketing. Intrigued by both the psychological and marketing and the statistical side of PPC marketing. How Does Groupon Win New Markets? Part of Groupon’s growth strategy has been through acquisitions. But even outside of that, they still push into new cities and markets. Before they can offer a unique selling proposition to small businesses they first need to build an email list. How do they get past the chicken vs egg issue? AdWords. And here is a landing page that consists of little more than branding and a lead generation form. Perhaps asking for email address only allows Groupon to get around that issue. More likely, being a well known brand in one market gives a merchant more leeway in other markets. And since Google tried to acquire Groupon, it is not likely that they can come down on Groupon without looking like it was done because the deal didn’t go through. What makes the above “website” so hysterical is most affiliates wouldn’t even dare try it at this point for fear of burning their AdWords accounts. Adding to the absurdity is the footer links to terms & conditions & data privacy link to pages in GERMAN even though the URL has en_ in it. Of course they are growing like a weed and will do some things sloppy as part of that, but at least they get the benefit of the doubt from Google – something most affiliates won’t be getting much of anytime soon, as Google moves in to become the affiliate channel with offerings like Boutiques.com. Shortly after going pink, Google has now decided to extend AdWords by placing their comparison ads below the AdWords ads. 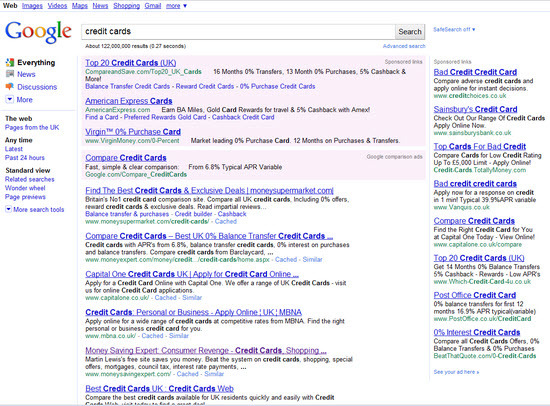 so if you search for [credit cards] in the UK there are now 4 ads above the organic search results. Thanks to Chris Angus for the screenshot. The click to call ads on the high end mobile phones are doing very well. The click through rates go up 6% when you put ads with a phone number, 8% when you put a local address. So, click to call is doing very well. It’s easy to see some of those. If you want, just take a look for yourself if you tried travel agency from a smartphone, you will see under thousands of active campaigns on click to call, so you can take a look at that. Site links is also making pretty good progress. We’ve given you examples on past calls where you type a big brand like Sears and then you see the more useful links that you can get through and the click through rates on those can go up as much as 30% over the ads without the site links. But we changed the way we do site links and we’ve added a new one line format. And that also allow site links to show up in more places. You can try flowers if you want to see that. Then the other format that’s getting some adoption is the – we are adding the seller ratings, which shows merchants ratings out of six stars aggregated from reviews on the Web. You see that if you look for things like digital cameras. And that’s doing pretty well as well. 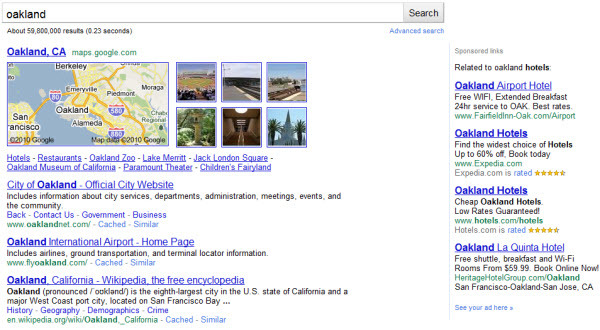 The net result of new ad extensions and new ad formats is the organic results keep getting pushed down. Of course it only impacts a few results for now, but over time it will spread…just like Google Checkout buttons on ads, advertiser ratings, maps, product search, video results, and news results have. 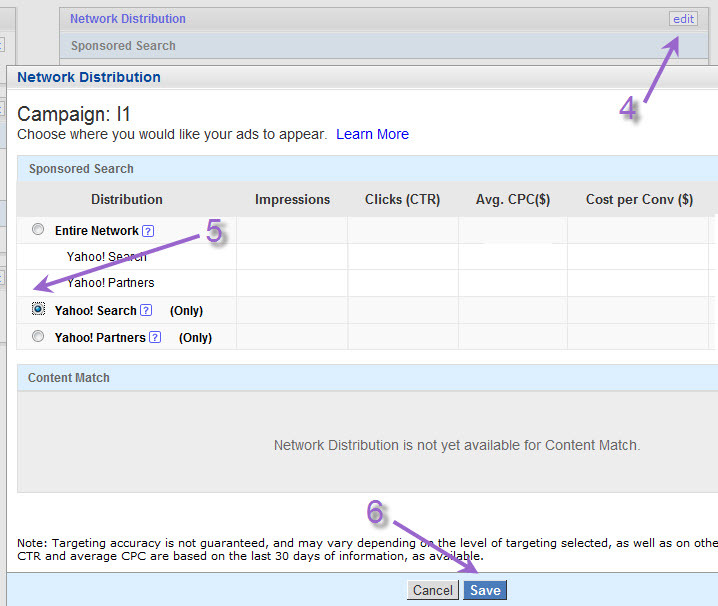 Each new feature gives your ads a new dimension to test. Couple in geo-targeting and dayparting and the possibilities are endless. What Google AdWords Match Type is This? & Can You Opt Out of Such Tests? Google recently announced the beta launch of a modified broad matching type in the UK and Canada, which is similar to old school broad match, back before broad became capacious. Bing has a similar feature in their organic search results, so perhaps Google wanted to borrow the idea without officially announcing it? They have less certainty on its impact on yield? They wanted to test its impact without warning advertisers into changing anything? Those longer tail keyword variations often have a different (and more precise) meaning than the core keyword, which makes them more potent. And so AdWords advertisers are willing to bid more for those clicks. But if those longtail keywords are being charged for ads showing up on the core keywords that might lower aggregate searcher intent, eating into the profit margins of advertisers who bid up more specific keywords. Which match type is being charged? Google hasn’t said. But some cursory searching for some of the above keywords makes it look like some of those ads might be phrase matched. How does this impact search as a whole? Does it make search quicker and more relevant? During the famous “brand” update of Google’s organic search results last year, Google looked at query chains / search funnels to find sites that were often clicked on after the second search, and promoted some of those sites into a better position in the initial core search result set. Perhaps this is a better way for Google to make search faster and more relevant. But even if the change works out good for searchers, as an advertiser, the impact on your account might differ. Its even worse when you consider Google’s recent big move into the travel market, and past nibbles into the hotel space. Back when I got into SEO part of the reason I wasn’t too into PPC back then was because I had limited cash, but another big reason I wasn’t big on it was because it seemed so simple and boring. Over the past couple years that has changed a lot! Today Google AdWords is far more complex than SEO was in 2003. With that complexity there are additional opportunities for some & additional expenses for others. But keeping up with all the changes is easily a full time job. Noticing that trend, and seeing stuff like the below image, I thought it made sense to try to create something great servicing the AdWords / PPC market. Google keeps controlling more real estate, and if you are not leveraging AdWords then there is a chance your business could eventually get pushed “below the fold” – perhaps not for longtail keywords…but certainly for the highest traffic and most valuable keywords in your industry. Google recently launched their vertical search panels, and to some degree you can think of many of these as what will eventually amount to some form of an ad channel (or a channel which promotes content from premium related partnerships with Google). I am decent at AdWords, but my level of proficiency is nowhere near my level with SEO, and so we needed the help of someone else if we were going to make sure that we had bar-none the best product/service on the market. And so we decided to partner with Geordie to turn PPC Blog into a great membership website which mirrors this one. This coupon will work for the first 100 subscribers, and then after the discount will no longer be available. Just like with SEO Book, you can cancel anytime and are under no obligation to stay any longer than you find it valuable to do so. If you do any serious amount of PPC it is quite easy to find a few tips that help you save $5 or more a day, especially when you consider how much PPC stuff Geordie has done (he has managed millions/yr in ad spend for the past 4 years & has brain dumped everything he knows) & how high quality the membership will be. Sad to see Yahoo! either bowing out from and/or outsourcing so many of their businesses. 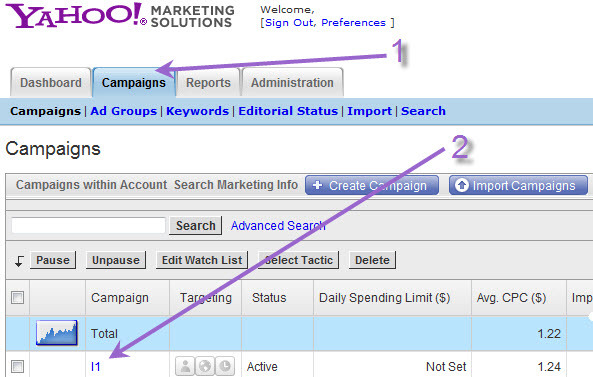 Given Yahoo!’s huge reach as a publisher and the idea behind audience matching at the likes of Quantcast, Yahoo! should have been fairly well positioned to run a distributed ad network. But since they sold off search they just keep cutting pieces. I would have thought that running a contextual network would have been additional free volume Yahoo! made while creating optimization algorithms for their own properties. Given their pending tie-in with Microsoft, it is a bit surprising to see them recommending Chitika (though the recommendation is a nice win for Chitika). Part of selling the search tie up deal with Microsoft was the idea of economies of scale driving increased yields. And now AdSense (which is already probably at least as dominant in contextual ads as Google is in search) just lost another competitor. For as saturated as online ad networks are, it is surprising that AdSense has such a big lead and that Microsoft didn’t make catching up with PubCenter a higher priority. One strategic positive for Yahoo! is that they have pushing harder into the original content development, but if they become more profitable with that will some of their content licensing partners start increasing their rates? 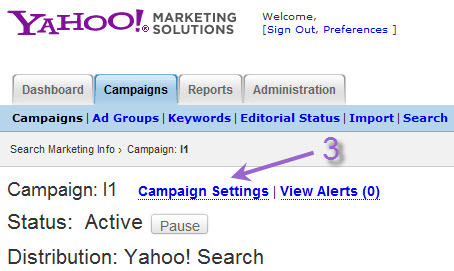 The single biggest reason Yahoo! had to gut their search efforts was that they offered a syndication network with tons of fraudulent search distribution, and never let you opt out of it until 2010. It killed their click value and simply made it impossible for them to create enough yield on their core search traffic. Google has long allowed advertisers to opt out of the content network and many search partners, and that has made their core market healthy. And given their efforts to detect fraud (and how smart pricing works on content websites) they have de-incentivized fraud to some degree. But now that content mills are being built, that trend may soon swing in the other direction. The more high quality links to your article there are on the web, the more highly a search engine will rank it. … Your family and friends are probably curious about what you are writing anyway. Send them links and invite them to take a look! Given that authors are paid on revenue share, what is the chance that say 5% or 10% of them will also ask family members to click on the ads while viewing the page? How could Google catch it? You could say I am cynical, but human nature is predictable and many of the kinds of people who work for the content mills will do anything to make a Dollar. Laws exist to catch the bad actors, but when the publishers are encouraging the creation of distribution amongst friends & family and the party responsible is concealed from Google, the incentives are aligned against the interest of advertisers. As fraud seeps in slowly, eventually it will become expected…either you engage in it, or your become an economically inefficient piece of the web – a relic. And most advertisers won’t know why their profits have dropped with the increasing number of clicks. Some will filter, but most of them will just lower their bids on the content network (or simply turn it off, as many did with Yahoo! ), which in the end harms the legitimate publishers who run AdSense ads. On one front they are stealing your content, and on the next they are destroying the value of the ads you carry. Like it or not, if you are an online publisher who depends on ad revenues it will impact you. The suggestion of the free virtual currency flowing back and forth really highlights the end goal of such efforts. How long will it take advertisers to notice? Outside of Mahalo & eHow, what other sites are engaging in the incentivized publishing programs? What sort of ROI have you seen from them? And how do you expect that to change going forward? Just because you’re good at something doesn’t mean the market cares any longer. It’s extremely difficult to repair the market. With that in mind, Google long ago highlighted that they didn’t like certain advertising arbitrage business models. Last year they went one step further by releasing a video claiming how searchers are demanding more for advertisers. One of the factors among many that will be key for marketers to be successful moving forward is that they’ll increasingly need to think about acting like a content creator, or thinking like a publisher is a way to think about it. When you walk into a bookstore, a Borders, there’s 500, a thousand magazines on the shelf, and each of those publishers is thinking about not how to stop, shock, interrupt, or detract that reader. They’re are thinking about “what is that I can say in this moment that will be helpful content to a reader”. The above such claims were, of course, nonsense. They are not what the marketplace demands, but are just a reflection of Google’s desire to sell more keywords and push advertisers toward buying more along the search cycle. But they have enough search marketshare that in the worst economic climate in nearly 100 years they can chose what money they want to take and what they leave on the table. Thin affiliates are viewed (at best) as unneeded duplication in the marketplace, and (at worse) purveyors of scams and spreaders of fraudulent offers. Most of the affiliate market could be clean, but the 2% of the market operating at scale with shady practices did enough damage that Google would rather flush the business model than spend time sorting through it. As of today, in some categories, the number of advertisers has gone from 50 to 5. The land has been cleared for people who create original products. A lucrative opportunity for content creators. But the only way you can survive as an affiliate on Google now is to have a website with a lot of great, original content, and an email list. It is nice to believe that we have Google’s power to change the market or that we can make the market like it once was, but profit is rarely (never?) created by wishing time goes backwards. If you know how to do targeted advertising it is not hard to take that knowledge and create a niche vertical product around it. 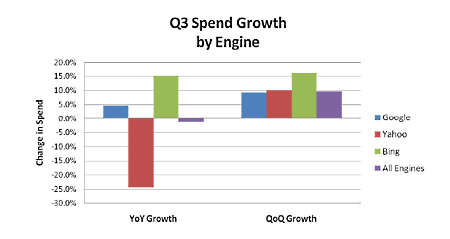 Lower margin and higher maintenance (at least off the start) than slinging bits, but over time as you build brand awareness, social connections, get marketplace feedback, and build organic traffic streams you enjoy margin expansion.